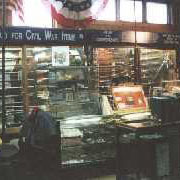 Civil War Preservations has been Buying and Selling authentic Civil War Swords & Firearms and Military memorabilia for over 40 years in the Pocono Mountains of Pennsylvania and on the Internet. Founder Kevin Hoffman, an acknowledged expert in Civil War Swords, was an avid collector since childhood. "I have been a major Civil War Collector & American Sword collector that has been involved in civil war artifacts for 50+ years. Life member and past Director Forks of the Delaware Antique Weapons Assoc. I have worked with Bruce Bazelon, (Department head of the State Of Pennsylvania Museum Commission) as well as authenticated artifacts for auctioneers and appraisal services. I have done appraisals for the National Park Service and worked with museums such as West Point, The State of PA museum, Texas Civil War Museum in Fort Worth, etc. I have consulted on behalf of many others." "I have appeared on a History Channel feature for supplying the information to recover over 3 million dollars worth of stolen artifacts from the Historical Society of PA."
"I have authored the ebook - Swords of Honor and Regulation showing more Union and Confederate swords in detail than any other publication." Gift Certificates are available for use with CivilWarPreservations.com purchases. After 28 years our store has had to close. The property was sold and we will not be able to re-open. The Website will continue and will soon be updated with some major changes. Thanks to all that visited our store! We have had a small online Civil War Museum for the past 15 years which continues to be enjoyed by our visitors. Please Email for comments or questions on the Museum.